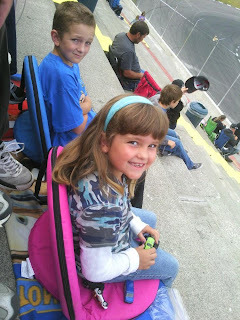 As a family we spend a lot of time at the race track, sporting events, parades and at the beach. We also enjoy playing board games and watching movies together at home. In addition to having fun and making memories it's also important to be comfortable. These folding chairs from HearthSong were the PERFECT addition for the kids! They are both comfortable and easy to take along. They lay out flat and have a nice strap to carry them over your shoulder. Easy enough that the kids can do it themselves! Both my kids were bragging about how comfortable their new chairs were. So, I had to give one a try myself and I have to agree! I also love the fact that the cover some off so I can wash it. 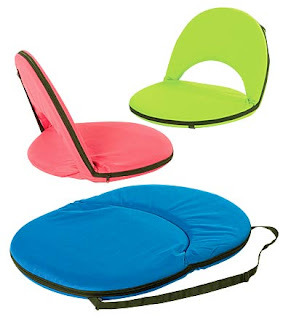 Available is 3 bright, bold and fun colors; Bright Blue, Hot Pink and Neon Green. Perfect for both boys and girls of all ages, including adults! HearthSong has more than just folding chairs. They have toys, games, arts, clothing, outdoor toys and so much more! I could spend hours just browsing through their great selection. Take a seat - anywhere! This clever 5-position seat with an adjustable strap is sized right for both kids and adults. Fold for a quick comfortable seat on the ground - play video games or board games, watch sports events, or just take a seat. Lies flat to make it pleasingly portable. Washable cover zips off for easy cleaning, too. Visit HearthSong and tell me another item you would like to have. A special thanks to HearthSong for this wonderful opportunity! Wow! They have tons of cool stuff, I like the geometric climbing toy, the stilts and the shell bags! Lots to like! but I like the Incredaball...looks like fun! My sonw ould LOVE the artist's textured brush set!